I don't really expect you to make these, but I just wanted to show them off. No, they are not enchiladas. I had 2 large leftover fresh lasagne sheets, not enough to make a "real" lasagne, so rollups it would have to be. I also had that beautiful sausage ragu leftover, so this was an easy dinner to put together. Have I told you that I HATE squeezing out the water from frozen spinach? Well I do. I have found the best way is to squeeze out the moisture with your hand. Mix some ricotta w/ drained cooked spinach, parmesan cheese and an egg, salt & pepper. Spread some of the filling in the center of cooked lasagne noodles and roll, baby. I added some sausage ragu to the filling, but you can keep this vegetarian if you like. Place your rollups in a baking dish with some tomato sauce on the bottom. Ladle some sauce over the pasta and sprinkle with shredded mozzarella cheese & fresh basil. Cover with foil and bake 40 minutes at 350F. Uncover and bake another 10 minutes until cheese is bubbling. 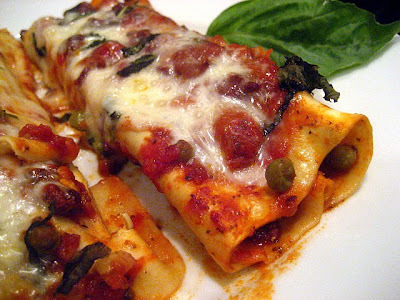 You've managed to turn lasagna into one of my alltime favorites - cannelloni. Too bad you didn't have more leftover lasagna sheets - I'd have zipped over. I absolutely hate squeezing out spinach and also grated zucchini! But I would love this lasagna of yours. Yum! We're making this next week :) Thanks for sharing!! Great use of all the ingredients. Yum. Bet they were good. This is a good idea when you're cooking for just 2 people. I made a pan of lasagna a couple months ago and we still have some in the freezer! 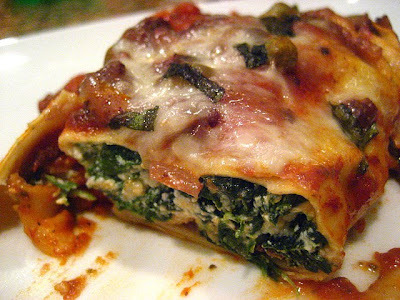 What a great idea - I love spinach lasagna. I would totally makes this, are you kidding? 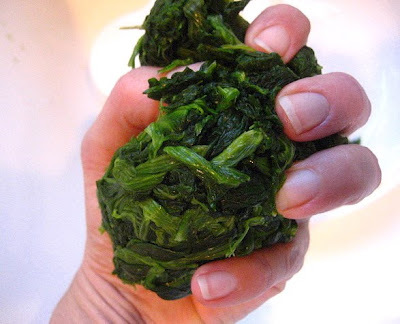 I use my ricer to squeeze out spinach. It works great, if you have one. I wish I had seen this recipe when I made a quick spaghetti. I keep pre-cooked meat in the freezer for when I'm feeling lazy. This would have been far tastier, and super easy. Next time! i think i saw that in this month's issue of "canadian living"! coincidence? I love this method - I do it all the time thinking how original I am -- who knew it was called cannelloni? Great idea to roll up the lasagna. I always save leftover sheets with that in mind and then forget to use. them. Also, I too absolutely hate squeezing water from frozen spinach. Always have. I don't like to squeeze out spinach either. Sounds like nobody cares for it. I do love Debby's idea of using a ricer to squeeze out the spinach. The lasagna rolls look great. Stacey, your spinach filling looks amazing! I think I see a caper? Yum! Hehe, your nails look amazing in the spinach picture. Well done!